Ocean Homeowner Loans have kindly teamed up with me to bring you this Summer Homeware Haul. How exciting! I love sprucing up my home over the summer with lovely pastel floral pieces. I am also moving house in a few days so I'm going to be decorating my new place very shortly. One of my go-to places to shop for cute homeware is Dunelm. They have some really pretty floral patterns so I couldn't resist picking a few bits up from there. The first item is the Candy Rose 12 Piece Dinner Set which retails for £24.99 which I think is more than reasonable for a patterned dinner set. Candy Rose is a pastel pink and blue rose print pattern which is adorable - and the crockery is just as pretty in person as it is on the website! Because I love the design so much - I also bought the Candy Rose 2 Tier Cake Stand which cost me only £9.99 which I think is ridiculously cheap for a cake stand! Again, the design is really lovely, I especially love the polka dots on this piece. Alongside this I purchased the Candy Rose Double Oven Glove for £4.49. I don't really have too much to say about this as it's only an oven glove but the design is pretty - I appreciate the gingham on the inside and it feels as if it will definitely insulate my hands when I'm using it. The final thing that I purchased from Dunelm is the Rose and Ellis Clarendon PVC Tablecloth which was £4.99. In summer, I love to throw cute splashproof tablecloths like this over my garden table when I'm hosting BBQs. As well as looking pretty, they protect the table and are easy to wipe down after use. I love this particular one and I cannot wait to use it in my new home. 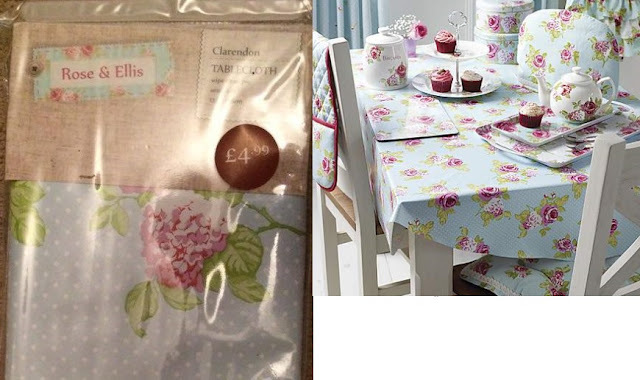 Also, £4.99 is an excellent price for a tablecloth! This concludes my little Summer Homeware Haul from Dunelm. Definitely take a look at Ocean Homeowner Loans if you're thinking of sprucing up your living space this summer, the smart search tool on their website doesn't affect your credit score at all and they are a really friendly company to deal with.